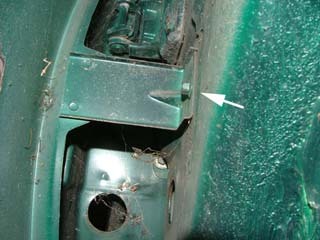 The front end panels, in common with most cars on the road today, are designed to be readily unbolted for easy replacement. 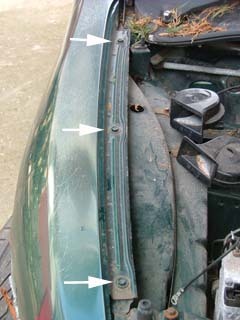 On the MGF and TF, this may be to replace corrosion or accident damaged panels. 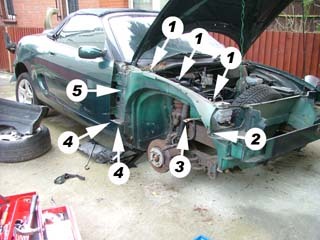 On this page, we look to see how to remove a front wing on an MGF. As will be explained, this is a relatively simple task - with the wing held in place by 8 bolts (locations shown opposite, right). 1. 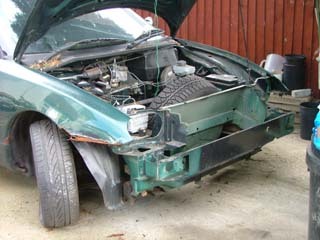 The first step is the removal of the front bumper and headlamps, as covered here. 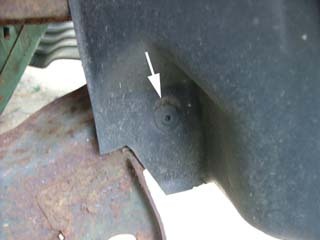 As you can see from the picture, the wing in question is heavily corroded in two of the commonest areas - between the front wheel and headlamp and the rear corner of the wing in the wheel arch. Surprisingly, the other problem area, around the side repeaters, was in remarkably good condition! 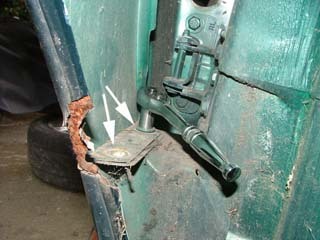 Now may also be a good time to remove the road wheel. 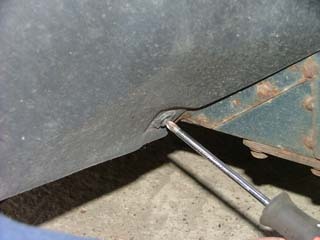 Ensure that the car is on a level surface and well supported (an axle stand is highly recommended here). 2. The next step sees removal of the three upper wing retaining bolts (arrowed, opposite) that hold the upper wing to the inner wing assembly. 3. 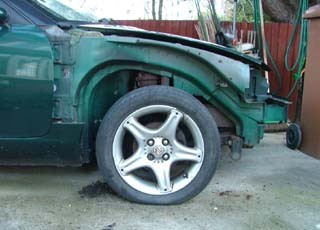 The next step is to remove the wheel arch liner. 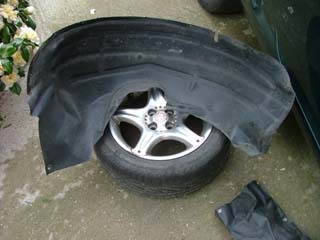 Once the road wheel is removed, it is straightforward to remove the liner - it is held in place by a couple of plastic expanding plugs (scrivets). These need to be identified. 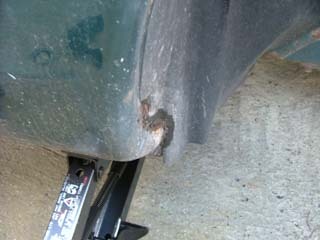 Once the scrivets are removed, the whole wheel arch liner assembly can be pulled away - as seen here. 6. 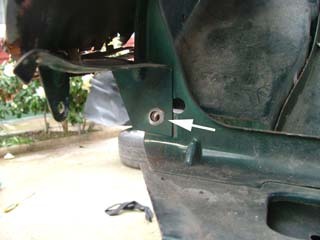 There are two 10mm head bolts attaching the base of the wing to the sill. Both need removing. 8. Before removing the wing, the side repeater needs removing. Slide the repeater rewards, and pull out. The lamp screws out - and the loom can be pushed through the wing. Now the wing can be pulled clear. The astonishing thing here is that despite extensive corrosion on the outer wing, the substructure remains in remarkably good condition (despite what is clearly very thin paint application in this area). 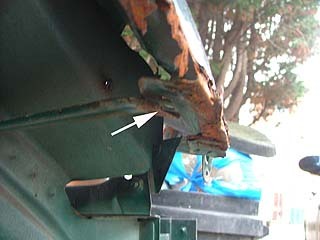 This is likely to be as a result of both good basic rust protection and the benefit of a plastic wheel arch liner! 9. Wing replacement is, remarkably perhaps, just a reversal of the disassembly process. Yes, wing replacement really is that simple!